Enter a dreamland where you can mingle with enchanted fairies and unicorns. Click here to play! Butterflies kiss your face while you roam the lush green gardens covered in sparkling dew and sapphire tear drops drip from the velvet leaves of the trees. Fairies will guide you through this enchanted garden. They only appear on selected reels, but the presence of these nymph-ish characters will double any winning combination. If you're lucky enough to spot the shy unicorns, you'll win big. Two to five of these majestic creatures will pay out 2500 times your original line wager. 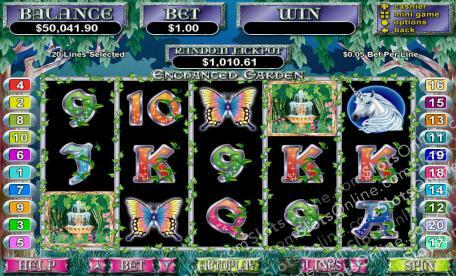 Butterflies are abundant in the enchanted garden and will win you up to 1000 times your wager if you can collect enough of them on your board. Gems and fireflies will also help you in seeking your fortune in the enchanted garden. If you activate the Firefly Feature in this garden, you'll be pleasantly surprised with bonuses such as free games and tripled prizes. Scatters and substitutes also help you create winning combinations along the way. Take a stroll through the enchanted garden to catch a glimpse of fairies and unicorns. You're likely to leave this paradise sitting on a small fortune. Two or more Garden icons anywhere on the board will multiply your total bet respectively. The Firefly Feature is triggered when this Garden icon appears on reel 1 and a Fairy on reel 5. It awards you with seven free games. All prizes are tripled during free games. The free games also feature a background firefly symbol. Get three or more of these symbols and you'll be rewarded with three extra free games. The mischevious fairy with green hair and pink gossamer wings acts as a substitue icon. She only appears on reels 2, 3, 4 and 5. She will substitue for all other symbols excluding scatters. Prizes are doubled when one or more fairies appear in a winning combination.